"Jamaican Memories By The Score"
1. TUNE IN.......2. BETTER MUST COME.......3. SCREWFACE ... 4. MEMORIES BY THE SCORE ......5..EVENING TIME ... 6. LEFT WITH A BROKEN HEART. ..7.BARBWIRE....8 NIGHT NURSE....9. CHERRY OH BABY....10 MANY RIVERS...11 PROMISE ME . 12.DANGEROUS DISTURBANCES .........13..CAN I CHANGE MY MIND.........14. LORD DELIVER US....15. LET HIM GO.....16. CRY TOUGH.....17. GO BACK HOME......18. MORNING OF MY LIFE.....19 El NINO.......... 20......CANDLE IN THE WIND.. When you hear the name Brother Dee two songs immediately come to mind, " Nengeh Nengeh " and " Bigger Boss ", two of the most popular recordings in the history of Jamaican music. The fact is that "Bigger Boss" also sparked a revolution , of sorts, in the Jamaican music industry because it heralded the involvement of big named Jamaican actors in music videos. Brother Dee not only wrote these two mega hits but also produced and performed them ("Bigger Boss" a duet with Shirley McLean). However these two songs alone do not begin to tell the tale of his influence on, participation in, and his contribution to, the music of his native land. The guitar styling of Dwight Pinkney (Brother Dee's real name) have been a part of Recorded Ja maican music since the earliest years of Ska. Dwight's first professional band THE SHARKS recorded many Jamaican number one hits at Coxsone's studio. His guitar phrases on songs like The Gaylads' "Lady With The Red Dress On" and Bob Marley and The Wailers ' "Put It On", were a must learn for guitarists of the time especially if they were working with the famous groups on stage. A premier session guitarist from those times Dwight's services are still sought after even now because of his innovative style and his incomparable and unique mastery of all aspects of the guitar's inclusion in Jamaican music. 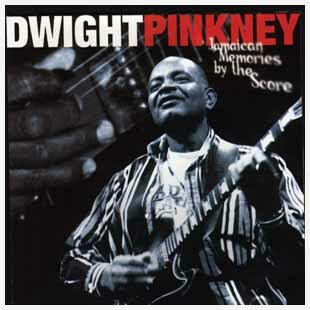 In the annals of our music, combos/small-ensembles stand tall and again Dwight Pinkney and his guitar propelled his Zap-Pow to being one of the most popular of t hese. This many time award winning band in its infancy boasted a keyboard-free aggregation that called on all the wiles Dwight could muster to complete a three man rhythm section (guitar, bass and drums) that provided the bed for sax and trumpet. Keyboard and vocals would be added later but in the formative years Dwight's guitar artistry was again key as is evident in Zap-Pow's classics hits including "Mystic Mood ", "Sweet Loving Love " and reggae million selling hit of the 70's "This Is Reggae Music", to name a few. The era of the late 70's through to the 90's saw a band called Roots Radics stamping its influence on the nature of Reggae Music by backing, in the studio and on stage, the hits of the stars that most affected Reggae during that time. Four name s; Bunny Wailer, Gregory Isaacs, Eek-A-Mouse and Yellowman recorded the majority (if not all) of their chart toppers with this aggregation. Once again the guitar work of Dwight Pinkney was a must learn for any guitarist who would play the hit songs of the s e stars, from Gregory Isaacs' "Night Nurse" (which has become a hit again through Simply Red's cover which also features Dwight's unique guitar "licks") to Bunny Wailer's Grammy Award winning albums. Dwight also wrote performed and produced (along with th e Radics) one of the most popular children songs in Jamaica "Reggae For Kids". This song is the title track of the second RAS Records album totally dedicated to the very young lovers of reggae. Add to all the above the fact that the guitar master has done a ll the solo work, in the studio and on the road, for Israel Vibration and Roots Radics Band for the past 14 years and you see why he had to take a hiatus from his solo career. Thankfully that hiatus is now at an end and Dwight Pinkney has put that inimita b le style of his to work on this 20 song collection featuring some unforgettable Jamaican classics, which naturally include his own "How Could I Live" and a new original "El Nino". "JAMAICAN MEMORIES BY THE SCORE" produced by Dwight and close friend Keith Francis (bass player with Chalice band) manages to show off Dwight's unique guitar artistry, but more importantly expose why he is a true icon in Jamaican music. YOU WILL ENJOY THIS GREAT COLLECTION OF VINTAGE JAMAICAN MUSIC ALL THE MORE BECAUSE DWIGHT "BRO THER DEE" PINKNEY TOOK THE TIME TO SHARE HIS GIFT AS GUITARIST WITH YOU. IT HAS BEEN A LONG TIME COMING BUT IT WAS WELL WORTH THE WAIT. GWAAN BROTHER DEE.S.Golding. Last revised: August 19, 2002.